In the depths of the gloom of the “B” word I decided to seek to look positively as to how I might cope with the prospect of being stripped of my freedom of movement across 28 countries. There was an obvious lifestyle choice to be made involving departing Blighty altogether. I did give consideration to that. I then toyed with obtaining a Polish passport. That particular course of action is still open to me, I believe. In order to seize the moment of taking advantage and celebrating my threatened status I resolved to do some travelling around Europe; my Europe, while it still can so be called. First of all we went on our summer holiday to Croatia and then I was fortunate enough to receive a gift from my wife of a September weekend in Nice. 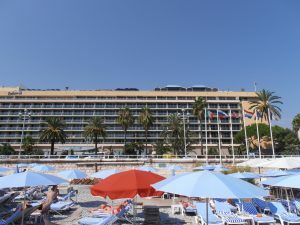 Conscious of the horrific event which occurred on the Promenade des Anglais in June I noted that she had booked us into the Radisson Blu, on the same street. 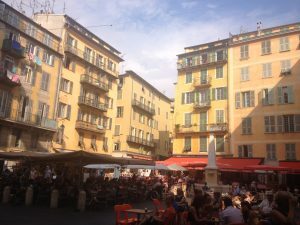 We had previously stayed in Nice en route to Corsica with the children when they were much younger and it was a city we always wanted to return to in the future. Noted first of all: the excessively expensive cost of a taxi from the airport given the short distance to the hotel and the extra luggage charge raised by the driver. 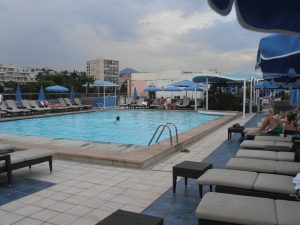 The hotel was sufficiently comfortable with its own beach and pool that I am embarrassed to say we failed to leave it for 36 hours upon arrival, save for a trip to an 8 til late. 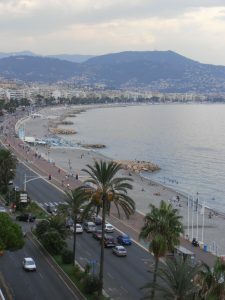 The Promenade des Anglais is a truly fascinating boulevard. 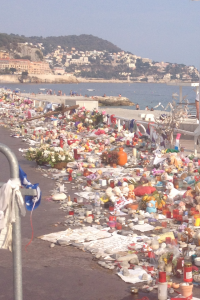 At one end, the Casino and at the other the Nice Côte d’Azur airport, an aeroplane park for private jets. More than ample to keep and hold your attention. Beautiful people jog along this wide, palmed avenue. The coloured blinds shield the occupants of the flats from the still powerful sun. The architecture along the promenade is varied but the underlying theme is grandeur, rather like Brighton; this is a city where affluent English holidaymakers strolled along the seafront, hence its name. The pebbles here are light grey however, meaning that in plein soleil the water adopts a vibrant blue hue, making the Côte d’Azur. Against the blue is the predominantly white background of the buildings along the front, interspersed with the odd piece of modern architecture, if that is what you wish to call it, our hotel included. One of the numerous buses took us into old Nice and the feel is Italian there. Narrow streets emerge into piazzas where parasols shade diners and drinkers from the afternoon sun. Whilst the food at the hotel had been good this was now an opportunity to sample something really niçoise and there is no better way to do so than by ordering a salade niçoise, moules frites or pissaladière. The latter is the subject of some controversy in these parts, it being rumoured that the pissaladière was the first pizza, before its concept was then adopted by the Italians who lay claim to it being their creation, having put cheese on top of the tomato base originally decorated only with black olives and anchovies. It was time to return and make departure plans. In order to walk off the impressive €15,90 set meal we decided to take in the entire avenue along its course. Old Nice with its bustle and narrowness was gone; as if we had emerged from a funnel. Everything was wide again, big. I had plain forgotten where we were as I gazed out to the Mediterranean and suddenly it was there. The noise of a sobbing lady caught my attention. I had a feeling that she probably goes there everyday day. She didn’t look like a stranger here. There are candles but most of all, cuddly toys. There’s a bear with the year 2000 printed on it. Having stopped for a crêpe we had enjoyed our sweet and now this was the bitter, the really bitter indeed. There is nothing you can meaningfully say to each other when faced with this. We headed back for the airport and post-“B” word Britain. We had gone over our own as well as the footsteps of English holiday travellers for centuries. This time, it was different however. Just as sweet but with a markedly more bitter after taste. “A fascist is one whose lust for money or power is combined with such an intensity of intolerance toward those of other races, parties, classes, religions, cultures, regions or nations as to make him ruthless in his use of deceit or violence to attain his ends”. So said Henry Agard Wallace, the 33rd Vice President of the United States between 1941 and 1945. A man well placed to pass judgement on such matters, it appears to me. I don’t suppose that Henry Agard Wallace ever visited rural Northamptonshire but if he did I’d wager that the village of Fotheringhay would have been up there on his “wish list”. This pretty village is the spiritual home of the House of York and then became infamous as the place of prolonged incarceration of Mary, Queen of Scots, ending in her demise. 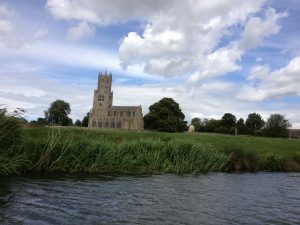 It is hard to see how Fotheringhay could have been the scene for such brutality. Apparently when Mary first set eyes on her final destination she uttered the word “perio” in her carriage. This Latin word means “I am going to die” and is how Perio Mill Farm derives its name, sitting alongside the road to the village at what was the first terrifying vantage point. When you visit the village now there is no castle. It was soon afterwards razed to the ground by Mary’s son, James I, save for a modest chunk of one of the walls. Now there is calm, unless the scouts are camping in the vicinity. Swans glide down the River Nene, and wedding bells peel frequently in the church of the House of York. King Richard III’s remains find themselves in Leicester to the annoyance of local historians. The words of Mary Queen of Scots as she faced trial by 36 noblemen without legal counsel and access to the evidence in support of her prosecution. All but one convicted her. We live in perilous times. Politicians in such times face their toughest test and the price of failure in rising to the test is invariably significant. It is believed that Elizabeth I never wanted Mary executed and she vacillated in signing the death warrant, but that hawkish political pressure caused her to perceive that she had no alternative. The present peril lies in the combination of the motives for leaving the European Union and the means of securing that end. Wallace’s comment on fascism is enlightening as to where we find ourselves now. The enthusiasm with which the Leave campaign is prepared to exit on any terms is alarming. We all know about the deceit by which they took the country to the precipice upon which it now flounders. A deceit that started decades ago but recently has known no boundaries whatsoever. “Grass roots” has become a catch phrase of late. I fear that the grass roots we may be observing are weeds capable of overpowering the garden and even eating at the foundations of the castle. My friend recently asked me why I was so worried. This is my response. I once read a play by the Swiss playwright, Max Frisch, named Biedermann und die Brandstifter. The play premiered in 1958 and its English title was The Fire Raisers. In essence, the character Biedermann is conned by an affable stranger and allows the stranger into his attic at a time when reports of arson are rife. He is then further duped and lets another stranger in. The warning signs are obvious to all apart from Biedermann and his wife. The attic becomes a stockpile of inflammable material and Biedermann then watches as he effectively burns his own house down. When I see loathsome Daily Express headlines fomenting intolerance towards our long standing partners and I perceive the lack of challenge from our politicians I am reminded of Biedermann, Mary, and the wise words of Wallace. If we had to look for any reason why we are floating around with no conceivable plan for dealing with the referendum result then here it is. On a day when the Prime Minister sounds the Grammar School horn we have a timely reminder of the power of education. I will doubtless be charged with accusations that I am ageist. I am really not. However, it is fair to say that there was a divide between young and not-so-young at the vote. That is not to say I am suggesting that young people are more clever; if you take Michael Gove’s perspective as Education Secretary then quite the reverse. He was always keen on tackling the “dumbing down” of examinations and making academic attainment more difficult to achieve. The raising of standards to times of old. It has been said that Grammar Schools were empire building machines, modelled on public schools. Remember the Raj Quartet? Ronald Merrick and the chip on his shoulder so excellently played by Tim Pigott-Smith? I am going to say this as I see it, without apology. To those who feel affronted by my comments I am sorry. People in this country have been educated to feel superior. It is not instinctive. That perception of superiority is taught, and the learning mechanism is very sophisticated. I mention elsewhere the imperial measurements so cherished by some but that is only a part of the process. 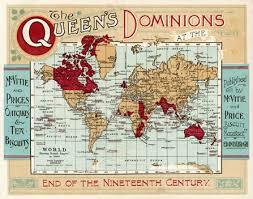 My dad tells me of a time at school when the world map was divided between the Empire and everything else outside it. If I remember rightly he said that it was outlined in red. I was born in the late 1960’s (you may or may not be surprised to know). I recall first going on holiday abroad in 1976. That hot summer which was even hotter in a tent. I recall that first feeling of being abroad. Real foreigners, speaking French. Excitement, and a tinge of anxiety at the same time. 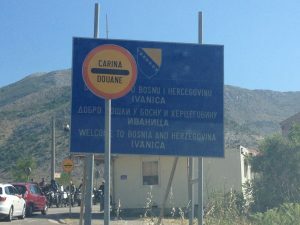 The same sense I felt recently as an adult when I crossed from Croatia into Bosnia-Herzegovina. 1976 was the first year that I had ever seen mountains deserving of the title. Not only mountains, but the roads carved round them at impossible heights by engineers who were not British, but had still managed such a feat. That summer I was also left for 30 minutes or so at the house of a French family we met on the beach at La Rochelle. My anxiety went into overdrive as my mum and dad disappeared off for some down time and I remember being comforted by this kind lady and her children; they offered me hot chocolate and a tissue. The words I understood not, the comfort offered I did. My eyes were opened to a new world beyond the English Channel. Language exchanges came and I started to become aware of an inner battle inside me. I now know what this was. A struggle between the acquired preconception of national superiority (based on the mere fact that I was British) and the reality. Some people never have the struggle. My beloved grandmother never travelled abroad. She had her torments but this wasn’t one of them. I remember arguing about patriotism with her; both my lack of and her abundance of it. Meanwhile 1970’s Britain served us all up “Mind Your Language”, an ITV sit-com featuring a language school and basing its humour upon a series of nationalistic stereotypes. If you are young enough to have been spared this I can set the scene by saying that the blonde nymphomanic was Scandinavian and the smooth gigolo Italian. That was the sort of “education” we were subjected to. I still hear people fall into this sort of stereotypical pigeonholing to this day, whether it’s “the French don’t like us” or “mañana, mañana”. My hackles rise when I hear any sentence which starts “The… (insert nationality before stereotypical description, complimentary or otherwise)”. We have Italians who love children and the family. Greeks who are laid back. Turks who pester blonde women. Germany is free of litter and Hitler built good motorways. It is difficult to see how the Netherlands functions with all that dope they are smoking. I shall not go on to Romanians. The Poles do work hard but the money all goes back home. Some British people still question whether the water in France from the tap is drinkable even though our water industry is largely French-owned. They also question the safety of electrical connections abroad although we are (maybe) about to employ a French company to construct a nuclear power station. Italian cars apparently rust (they might have decades ago but what’s to get in the way of a good stereotype). According to our supermarkets everything British is superior. Unless it is German and mechanical – and because they are good at those things this means that they in fact want to rule and dominate us all still. If you go to a supermarket in France you might find a chalkboard saying “Origine: Espagne” next to the oranges but in the UK you cannot avoid the message. It’s not even subliminal, it’s perfectly overt. Spanish strawberries? Have you heard this one? No flavour, apparently. “The English have more common sense than any other nation, and they are fools”. Decades of “fat cats”, “gravy trains”, and “potty bureaucrats” well-established in the British psyche and largely unchallenged. TB’s educational legacy – cause for optimism? Tony Blair’s government post 1997 committed to invest in education and, in my opinion (and it’s a relatively informed one) it at least partially succeeded. 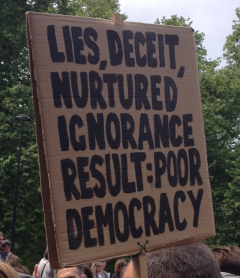 I wonder how much of the Blair government’s work on Education x 3 succeeded? Work which would have been assisted by widening travel opportunities, experiences and social media exploding boundaries. If voting habits in the referendum are anything to go by maybe more than we all realise. Listening to the Middlesbrough-based prospective UKIP leadership candidate who joined Nick Robinson on Radio Four on 2nd September brought Antonio Tabucchi’s quotation into focus. He talked of decent, working people, advocated tax cuts, minimising government but at the same time wished to throw money at the NHS. In his vision of a UKIP-led country evidently spending on the armed forces “to protect us” would not be under threat, rather bolstered by the cut in the foreign aid budget. Nick Robinson asked him how this could work. The response was as devoid of reason as was the quitters’ plans for the country after… (the word I am no longer using because it is so nebulous that it has no discernible meaning). There is no doubt that xenophobia has been used as an aggressive tool in the United Kingdom. If Tabucchi was right (and I think he is) then we can turn his words around to examine why our country has provided fertile ground for this assault by the far right. Far from being a civilisation or culture that is strong (as they suggest it is) there is an underlying weakness – social and economic division; the haves and the have-nots. I have argued at length about the cause of the outcome of the vote and been dismissive of claims by friends and relatives that this was partly about economic hopelessness. The sense that people in certain parts of the land had nothing and therefore Mark Carney’s words of wisdom were irrelevant to them. If you don’t have a house, why would you be bothered about its value dropping? My tendency was to cast blame on mainly affluent southern Tory voters. Yes, statistically, they were the group who delivered the shock, because it had always been assumed that “when it really came to it” house prices and pensions would win the day over uncertainty. However, with a less than 52/48 of a margin the significance of the economically disaffected subjected to aggressive xenophobia cannot be underestimated. These are frightening times. The European Union was a largely positive force against poverty and socio-economic deprivation. Yet, those who have the least in the north have not been persuaded by Jeremy Corbyn and UKIP’s aggressive xenophobia has been effective. As Tabbuchi described nomadic culture to be at risk so too it appears are those who live in areas which might be seen as economic deserts. The only way to combat the rhetoric and aggression of xenophobia is with a more than equal measure of genuine hope for a better future. Who can provide that? One positive thing this Government has done is recognise (in words if not actions yet) that society must have a place for everybody. Water must be found for our deserts to stop their inhabitants being so manipulated. If that means reducing the reservoirs and abandoning the aspiration of keeping them full then at least Philip Hammond appears to have a measure of this. Scant reward for those of us who never agreed with austerity, let alone that word. The timescale from the announcement to the polling day which appeared to me to be rushed at best. 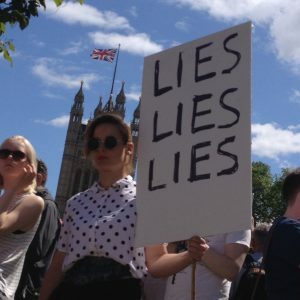 The Leave lies which were having a positive effect on their campaign, as was their “Project Fear” scare myth and the failure of mainstream media to expose the lies to non-politicised audiences; this combined with the vitriolic rhetoric evident at the BBC’s Great Debate I attended caused me to leave fearing the outcome. When I gave a brief interview to a Swiss TV reporter outside she commented on the emotional nature of it – I was evidently a worried man. However, as I leafleted I always used to look at the Remain literature to satisfy myself of its contents. Yes, it was full of crystal ball gazing but the comments and quotations were genuine, unlike the £350 million lie so readily conceded by Nigel Farage on live TV the morning after the vote. The ERS report has vindicated my right to feel concerned before the campaign began which I have detailed above. 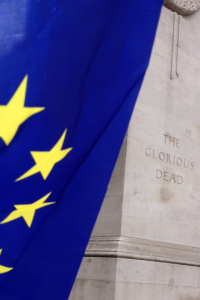 Consequently whilst I am happy at the findings of the ERS in highlighting the farce of this insult to the democratic parliamentary process I am a little disappointed that it has not really “gone to town” against Leave. In my work as a lawyer you learn to put your client’s best case forward. There are, however, clear lines of demarcation. Future gazing will always be slanted by your own mind but peddling blatant claims which are demonstrably incorrect (£350 million a week?) stands deserving of a particularly uncompromising judgement and outcome. I know that is what would happen if I misled a Court, or, for that matter, an opponent.